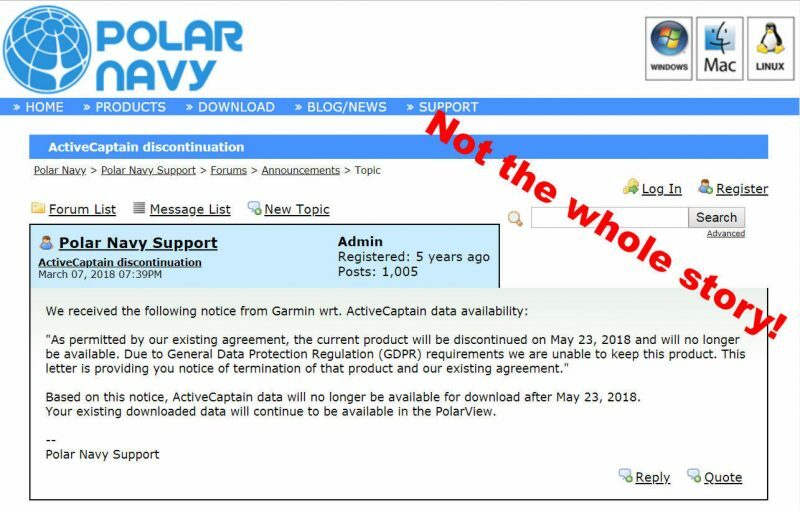 Despite our phone conversation with Garmin cartography manager Ken Cirillo, the company had still not officially declared their plans for ActiveCaptain in writing. 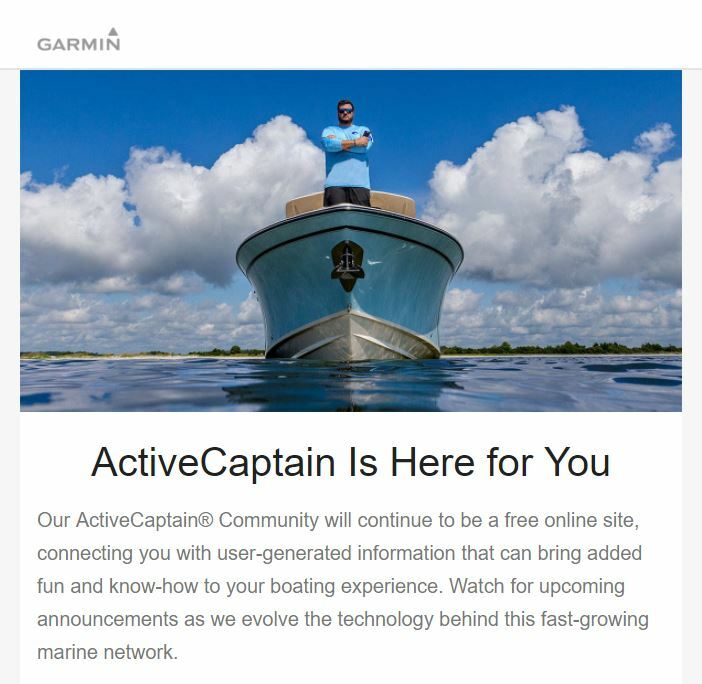 That changed today with a Garmin email to AC captains beginning: “ActiveCaptain Community will continue to be a free online site…” That statement echoes what we were told by Cirillo, along with his assurance that Garmin remains committed to working with AC partners (i.e. independent app developers). And there’s more official good news in the email. 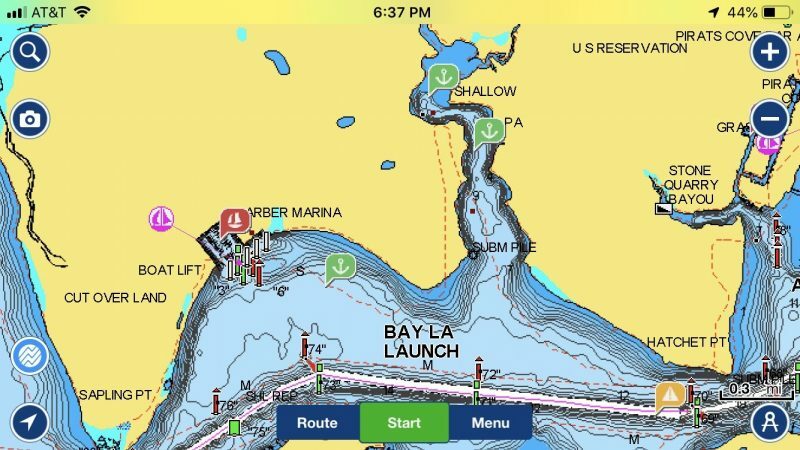 Since Garmin acquired Navionics the obvious question has been, will Garmin integrate ActiveCaptain Community into the Navionics Boating app? For many that’s been the one important feature missing from the otherwise capable Navionics App. Thankfully, the answer to that question is yes, though the timeframe is a little vague at before the end of the year. It’s taken Garmin some time but the picture does seem to be getting clearer. The big question remaining is how many partners will be willing and able to implement the new AC Community API before the May 23rd deadline, when apps with the old API will no longer get data updates. We’ve heard mixed reports, but May 23rd is just over a month away, so one way or another we will have some answers pretty soon. Interesting comments regarding the Active Captain and the direction Garmin may take in the future. I believe they have an opportunity to expand the system to intergrate an electronic logbook and boat maintenance app. 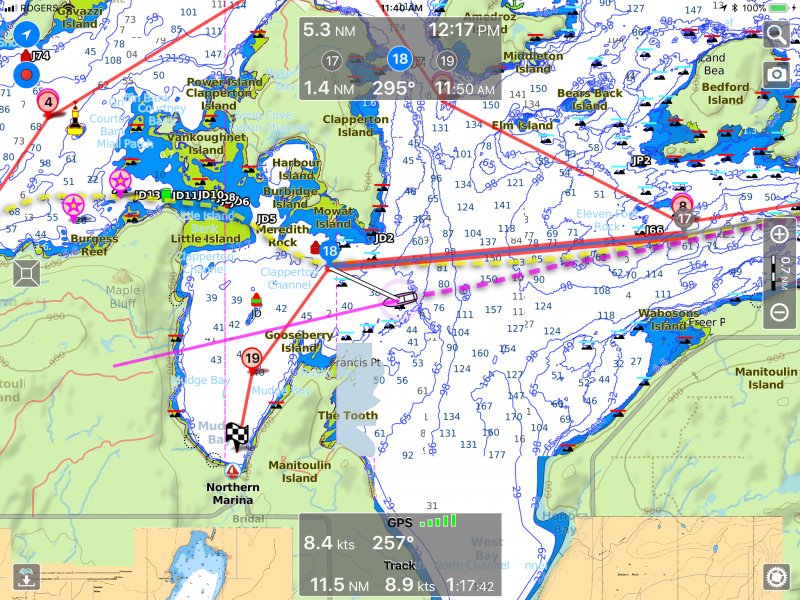 Taking live NMEA 2000 data, logging tracks, engine revs, temp, tank levels, AIS and so on and producing a printable log and management reminders for oil, water, bottom wash……. While there are other apps out there they run separately from the Garmin network and who knows how long the developer will last or stay current with updates. Will the old BlueChart Mobile work with the new API, or will updates cease to work 5/23? Unfortunately, I expect it will stop working. Garmin is not updating the app any longer and without updates, there’s no way it would work with the new API. Will I still be able to use ActiveCaptain Community on BlueChart Mobile? BlueChart Mobile will continue to be able to download the data from the community. The app is not being updated to support the new data fields and it won’t be able to add content back to the community. As a reminder, if you are a Garmin electronics customer you can use the free ActiveCaptain Application, on iOS and Android, to access and edit data. Being new to AC, perhaps I was easily impressed with the GPS to iPhone flexibility, but beside an iPad – is there any intention bringing these features to a MacBook Pro for benefits as a larger more fully functional remote? 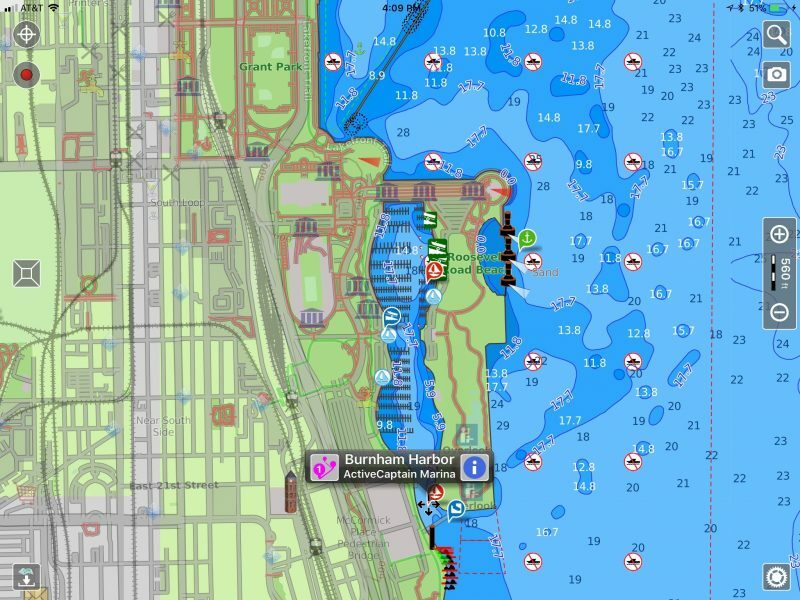 Can you clarify if you mean the Active Captain Community features or do you mean the features of the Active Captain Companion app reviewed here: https://staging.panbo.com/garmin-navionics-part-2-a-close-look-at-activecaptain-the-app/? There are a few applications that can display Active Captain Community data listed here: https://activecaptain.com/help/apps-applications-mac-osx. For route planning and transfer you can also leverage some of those applications. The one thing I don’t think you’ll be able to do on your Mac is screen mirroring and control of a connected Garmin MFD. So I got an email from Garmin/AC today, and while most of it was pretty straight-forward, one bizarre detail emerged: if I want to maintain my Active Captain account, I have to log into Garmin on a single day (May 23rd) and transition to the new system. Not “any time between now and the 23rd” or for a couple weeks starting on..”, but for ONE SINGLE DAY – and if I’m unavailable, out at sea or whatever, my AC account vanishes without a trace. Seems really odd to me. I can tell you it doesn’t work right now. Whether it will work after 5/23, I don’t know, but that’s not how I read it. 🙂 Not that losing my “points” is a big deal, but it’s annoying. I sent them a query, I’ll let y’all know if I hear anything from Garmin. The ability to post or edit AC reviews/markers will come later –“most likely v4” — because the new API has user sign-in security that’s apparently hard to integrate with TimeZero. 5/23 is rapidly approaching. That’s the date Garmin has said they will shutdown the old API. I’d expect that at that time a lot of apps will stop working with AC data. I’d recommend anyone dependent on that data do an update on 5/22 to make sure they have as current of information as possible while the dust settles. 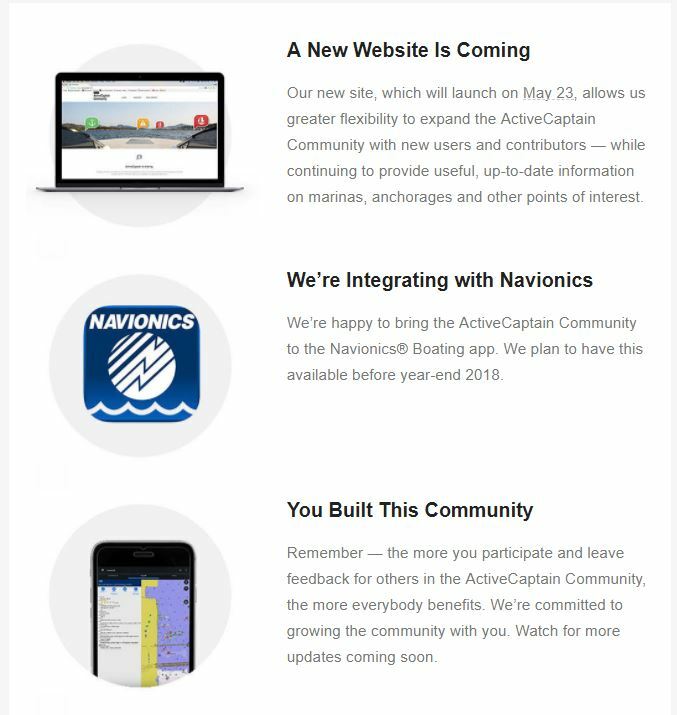 According to Garmin’s email, today is the day for the new ActiveCaptain website. I’ve been keeping a careful eye on the website but so far I don’t see anything new. I just tried updating the AC database in BlueCharts Mobile. It was working yesterday and this morning and now shoes a communications failure. I suspect that’s indicative of the old API being shutdown. The website remains unchanged as far as I can see. The language about having to do it on the 23rd of May remains on their site, so maybe being out of the country on Wednesday has left me permanently out of the system. At any rate, I’m working on a review of the new site, and welcome comments from anyone using it. My point was that since someone has already grabbed my old “display name” (Atsa), I can’t connect my old AC account and my new Garmin account. I’m not so much complaining about the loss of “points” as the connection I had with my entries in AC – I initiated a couple of anchorage marks, left comments/reviews in lots of places and the increasing point total meant that I had experience with AC – all lost & gone away now, and someone else is posting in my name. I suspect I’m not alone, and I bet lots of AC folks are garping at Garmin right now – it will be interesting to see if they respond to me or not (they never responded to my earlier questions). All I know is that when I try to put my “Captain Name” in as “Atsa”, the site says that someone already has that name. It doesn’t recognize my name at all, and if I try to put in the words the way our “captains name” was before, it won’t allow it because it’s too long. I went on the map site, and looked up an anchorage I added & reviewed, and it is displayed under “Atsa”, not under any version of our names. Oddly, the point count associated with it was higher than I remember (but my memory might be faulty). I’m going to go with “screwed up implementation” right now, rather than deliberate thievery 🙂 – “never attribute to malice what can be explained by simple incompetence”. What will tell me a lot is if they do any work to fix it. Sorry, just remembered that when you enter your “ActiveCaptain Name” it always says that it’s taken if it’s already in the AC database. Then you claim it with your AC e-mail address. So it’s the long address that’s the problem, and hopefully fixable. Isn’t that what you get? Doesn’t it sound like Atsa remains unclaimed? Success! the solution was, however, bizarre.  I had created a Garmin account using my current gmail address. When I attempted to associate my old AC account, it gave me the “..please provide a different value” response. So I created a new, different Garmin account using a different email address – and THEN it accepted the “Atsa” entry and allowed me to enter my gmail address as the “old AC address”. At this point, I’m going with “screwed up software”. At any rate, no thievery was involved, just PP software. As far as a review of how it’s working for me from the web (my usual approach), it seems to work fine – though in a very different way than before, it actually seems better once you figure it out. I used to get frustrated with the old site sometimes, when the screen was covered with symbols and clicking on things didn’t work right. I’m a little disheartened that it seems every turn is met with a lot of confusion and unexpected results. ActiveCaptain Community is the current holder of the greatest concentration of cruising information. Ben E’s recent trip up the NJ ICW illustrated that even this repository of information has challenges with accuracy, frequency of updates and grooming of data. I’m concerned the issues with users gaining access and updating data are going to exacerbate those weaknesses. I am interested in your 24 hour non-stop trip. This is something I would like to do but am reluctant to try for several reasons. First is the thought of falling asleep. Second is what preparations to make that would be different than doing the same trip, but by taking shorter distances to be able to spend the night to get some sleep. However, I was surprised yesterday when my test TZT2 did not show the old data, but instead asked me to log back into AC, which did not work. Was that an anomoly, or just because my TZT2 is online through my boat router, or is it happening to all TZT2 owners? I’m trying to find out.